There have been a number of terrorist attacks within America over the last two weeks, with the New York and New Jersey bombs, the knife attacks in Minnesota, the Washington Mall shooting the following week, and another very strange occurrence we will detail below, but these events are being treated by the mainstream media as separate and unrelated events, and in their initial reporting they are deliberately misdirecting the American public. Let me explain, using the Washington Mall shooting as a clear example. On September 23, 2016, initial reports came out about a gunman that opened fired in the makeup department of a Macy’s store in Seattle, Washington, killing five people, offering a description of the suspect they were seeking. Those are just a few examples, and I would lay odds that the majority of Americans, if asked, would still believe the suspect was a Hispanic male, but in reality, it was Arcan Cetin of Oak Harbor, Washington, is originally from Turkey. Initial reports are what people remember and the MSM and law enforcement are more than aware of this. The suspect captured and being charged with the bombings in New York and New Jersey, was Ahmad Khan Rahami, an Afghan immigrant. The man that went on a stabbing spree in Minnesota was Dahir Adan, a Kenya-born Somali immigrant. We see most reports about Adan highlighting key words such as “lone wolf,” and ISIS “inspired,” yet an Islamic State-run news agency, Rasd, claimed Sunday that the attacker was a ‘soldier of the Islamic State’ who had heeded the group’s calls for attacks in countries that are part of a U.S.-led anti-IS coalition. There is a pattern we note here, where law enforcement with the help of the MSM are misdirecting, using a basic psy-op strategy in order to create first and lasting impressions as well as using specific key words such as “inspired” rather than directed. 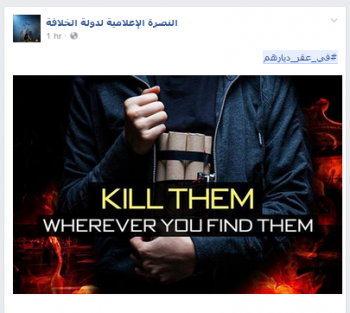 Make no mistake, ISIS has instructed supporters, members and sympathizers to conduct “lone wolf” attacks. This is very important because as ANP noted just days ago, Homeland Security Director Jeh Johnson, an Islamic sympathizer himself, created a new label to be slapped on terror attacks, for the specific purpose of misleading the public, so that they wouldn’t be aware that what we are watching is a series of planned Islamic terror attacks on U.S. soil. Terrorist inspired, terrorist enabled, rather than Islamic terrorism, all in an attempt to misdirect the American public. At the height of morning rush hour, a New Jersey commuter train packed with passengers and traveling way too fast crashed into Hoboken Terminal, killing a woman waiting on the platform and injuring more than 100 others. Witnesses said the train overran its stopping point, slammed into a bumper block, went airborne and hurtled through a passenger concourse at about 8:45 a.m. at the terminal, one of the busiest transit hubs in the New York area. The train “accident” occurred on September 29, 2016, the same date mentioned in the hacked FEMA alert. 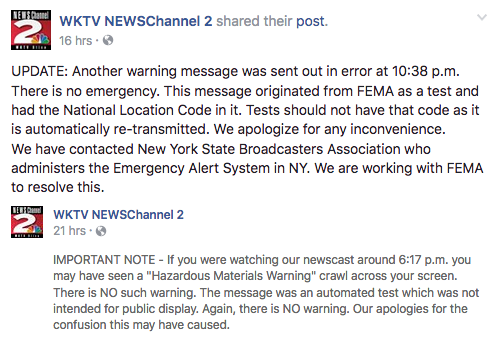 Via SHTF Plan, we see that WKTV immediate issued the following statements in regards to that message, with no mention of the reference to a train. Readers should be asking themselves “what are the odds of multiple attacks and bombings, all by Islamic terrorists, all happening within a two week time frame?” We should also be calculating the odds of it being a “coincidence” that a FEMA emergency broadcasting hack would reference a train just hours before an actual train wreck occured, in the same general location where the broadcast was shown, also in the same general area that an Islamic terrorist planted an explosive device. How many of your local news stations have pointed any of that out? How many MSM so-called journalists and reporters have even asked about it or bothered to even “inform” their veiwers/readers? Last but not least, how many lives will be lost because the Obama adminsitration, law enforcement and the MSM, are hiding information from the general public, misleading them about attacks that have already occurred on U.S. soil, and misdirecting them when they can not hide the reports. There is a very high probabilty that terror cells across America have been activated, specifically in states where a significant amount of supposed Syrian “refugees” have been imported, such as New Jersey, NY, Minnesota, and Washington state, coincidently (or not!) the same states where the most recent attacks have occurred. Keep your eyes and ears open folks, be very aware of what is happening around you. Stay away from big groups and events with a large attendance. Read Also: H2O Dynamo – The Awesome Device That Turns Air Into Fresh Water! Quake Expert Warns Of ‘Natural Disasters Of Potentially Apocalyptic Proportions’ – Was ‘New Madrid Quake’ The Start Of Something Big?